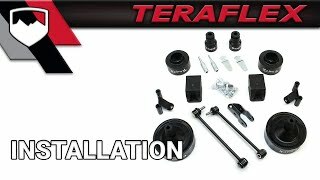 The TeraFlex JK/JKU 2.5” Performance Spacer Lift Kit is the most economical way to fit larger tires and increase ground clearance with the least amount of modifications. Don’t let its affordability fool you; this 2.5” Performance Spacer Kit includes the innovative TeraFlex spring retention spacer that prevents the spring from dropping out during extreme articulation. 2012-2018 JK/JKU models require Exhaust Spacers (# 2610000) or other exhaust modification for proper driveshaft clearance if front extended shock length is greater than 24.5”. • Also available w/ shock absorbers (# 1255200) or w/ shock extensions (# 1355210). • Requires Shock Extensions (Front Upper: # 1553800 and Rear Upper: # 1554800) or longer shocks (not included in base kit) – TeraFlex 9550 VSS (# 1545100) or Falcon shock absorbers recommended.